John and I handmade so many items for Bug’s lumberjack birthday party that it couldn’t all fit in one post! 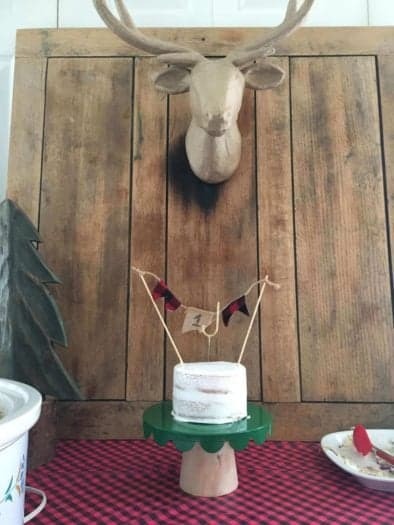 I showed you a little bit of the decor in my last post about his lumberjack birthday party. 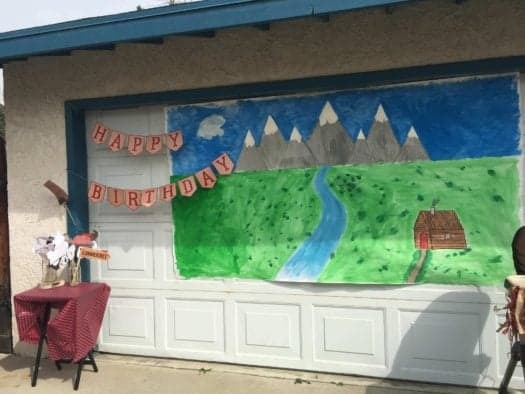 I wanted to show you a little more of the decoration that we made for his party and also give you access to some free lumberjack birthday party printables! 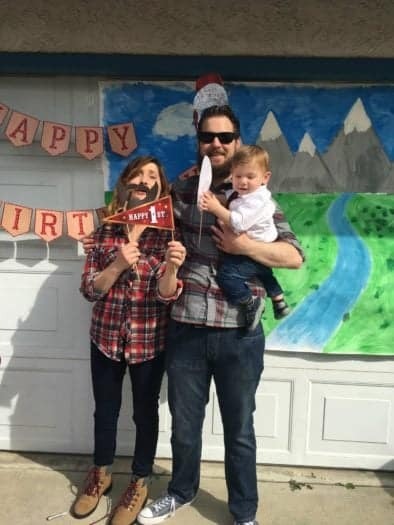 I found these adorable lumberjack photo booth props on Etsy and I knew they would be perfect for the party! They were super easy to print and cut out and were a big hit, everyone loved them! 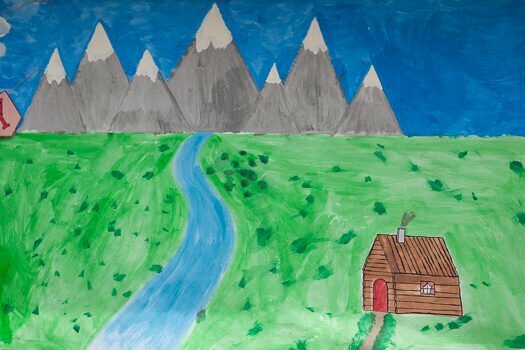 I wanted a unique backdrop for the photos, so John drew and then we painted some white background paper to look like mountains. It came out super awesome! We attached the mural to the garage and put the prop table next to it. I also attached the Happy Birthday banner from our Etsy shop. Here’s the birthday boy and us! His favorite prop was the balloon, of course! 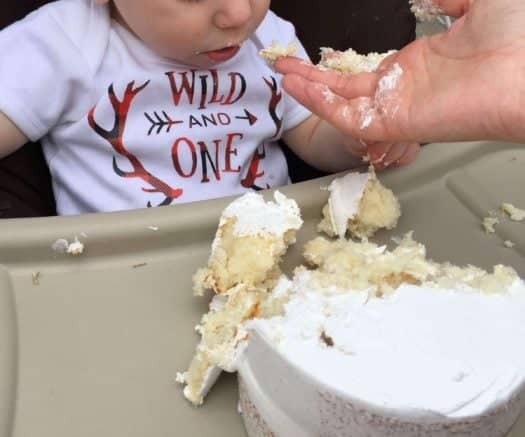 We kept his cake simple, just like we did for his cake smash. My mom had bought me this J sparkler for my baby shower, it was so cute on his cake! My mom made this banner from ribbons and the printable banner from my Etsy shop. 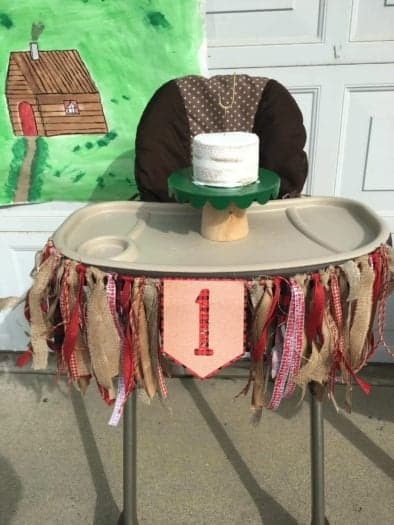 It was so cute on his high chair. 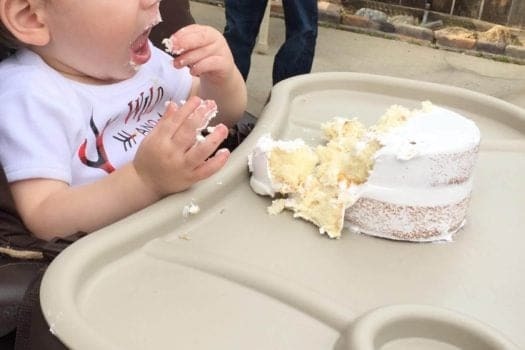 He still wasn’t super into the cake, but he was still super adorable. I love this “Wild and One” Tee that a friend got for his birthday. It’s seriously the cutest thing! For everyone else, we had s’more cupcakes. Just regular chocolate cupcakes with marshmallow topping. 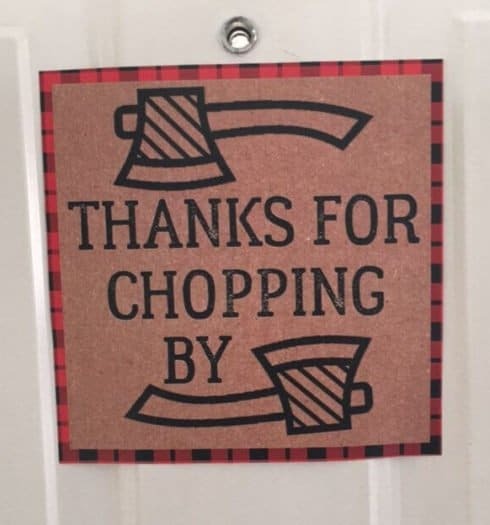 As people were leaving we had s’more party favors with “Thanks for Chopping By” written on them. The s’more mix was: mini chocolate chips, mini marshmallows, and Golden Grams. They were super delicious. 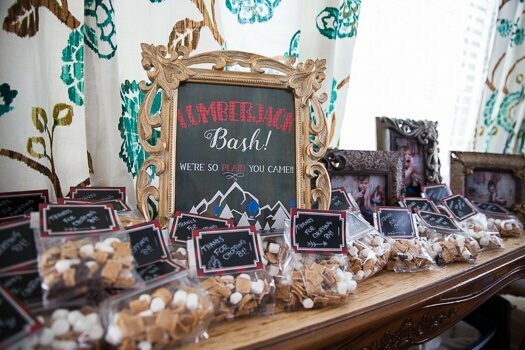 We also had pictures displayed on the table, as well as the Lumberjack Bash printable from our Etsy shop! Fun fact: the reason there are hot air balloons on the printable is because the theme for my baby shower was “Oh the Place’s You’ll Go” and the nursery theme was hot air balloons, so I wanted to carry a small piece of that into his first birthday and beyond. Then I had this cute sign on the door thanking people for coming. This is just one of the printables you can receive by signing up for my newsletter! 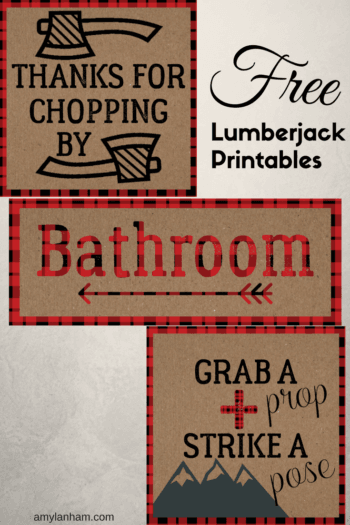 I signed up for your newsletter, but I don’t see a way to get the free lumberjack printables?? How do I get the printables? I wanted to sign up for your newsletter but don’t see anywhere to do this. Can you please help me? 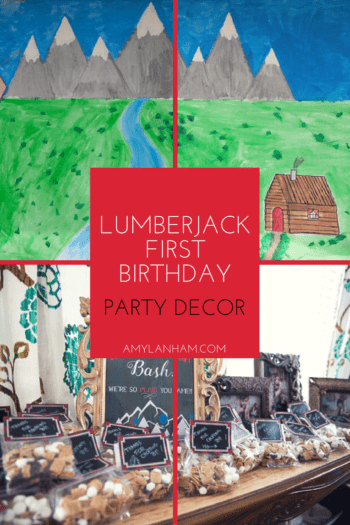 I would like a copy of your free printables of the Lumberjack first birthday party. I sent you an email! But you can always sign up for our newsletter at amylanham.com/vip. Thank you!